Cognex Corporation and Allegion stocks both command valuation premiums. Here's a look at each company's growth prospects. Machine vision company Cognex Corporation (NASDAQ:CGNX) and security products manufacturer Allegion (NYSE:ALLE) both have stocks that trade at a premium to the market and to their peer group. As you can see below, both stocks trade above a clutch of companies exposed to industrial automation and/or construction spending. Let's take a look at why. It's been a bumpy few years for the machine vision company. Last year was characterized by disappointing efforts to book anticipated large deals in consumer electronics and logistics, but 2016 has seen revenue growth exceed management's expectations for four quarters in a row. In short, it's been a return to form for the company. Not only is Cognex firing on all cylinders, but there are reasons to believe it has medium- and long-term growth drivers in place. Here are five key growth drivers to look out for. Cognex Corporation is expanding its TAM with new products. Image source: Cognex. There is a secular trend toward wide-scale adoption of machine vision technology in industrial automation. Management has a long-term target growth rate for its ID products (e.g., bar-code readers) of 30%, which would contribute significantly to the expected overall revenue growth rate of more than 12% over the next two years. The automotive industry (a key end market for Cognex) has led the industrial sector in implementing robotics and industrial automation, and it's likely that the rest of the sector will follow. Management has taken significant strides in expanding its total addressable market (TAM). Moving into the rugged mobile terminal market (bar-code-reading capabilities compatible with smartphones) expanded the TAM by $500 million, while bar-code readers for airport baggage expanded it by $50 million. Cognex is increasingly winning large orders from customers like Apple (which was responsible for 18% of its total revenue in 2015), raising confidence in the company's ability to generate future significant orders. Expanding into areas like consumer electronics and logistics demonstrates Cognex's ability to expand into new industry verticals. It's a stated aim of the company and adds more growth potential. Donald Trump's presidency could bring about a resurgence in the U.S. industrial sector -- good news, because the Americas region has been lackluster for Cognex during the last year or so. An increase in confidence would encourage companies to engage in the kind of capital spending projects that Cognex relies upon. All told, analysts already have Cognex growing EPS by 28% and 12% in the next couple of years, respectively, but all it will take is a few of these growth kickers to make good and they might be rushing to revise estimates higher. The stock may not be a screamingly good value right now, but investors are paying a premium for the growth potential. Allegion locks and doors keep buildings secure. Image source: Allegion. Convergence of electronic and mechanical security products means Allegion can add value to its existing installed base of customers. Adding wireless and web-enabled technologies to locks will create significantly more functionality for users. Allegion's solutions will help commercial and industrial customers cut fraud and reduce loss of inventory. In a nutshell, Allegion's wireless locks allow users to configure and monitor locks. Access can be granted to or taken away from certain staff, and the information from the locks can immediately enable companies to monitor exactly who is accessing designated areas. In short, there is a clear value-add from the Internet of Things. It appears to be working, with the company expecting 5% to 6% organic revenue growth in 2016. Overall, analysts are expecting EPS growth of 12.2% this year and 9.4% in 2017. And just as with Cognex, investors are willing to pay a premium for Allegion's long-term growth prospects. 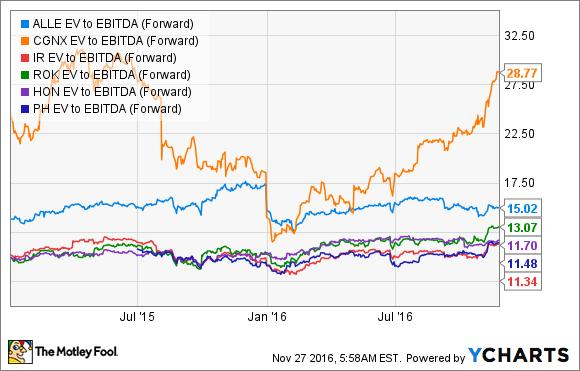 Time to be bullish on Allegion and Cognex Corporation? Image source: Author. Both Cognex and Allegion are attractive stocks, and investors should be willing to pay premiums for companies with strong long-term growth prospects. That said, Cognex has had a great run this year (up nearly 80%) and the stock's trading history has been volatile. Allegion is more conservatively valued, but doesn't possess as much potential for upside surprise. All told, they are great stocks to monitor and to pick up on any weakness, but for now they look fully valued to me.